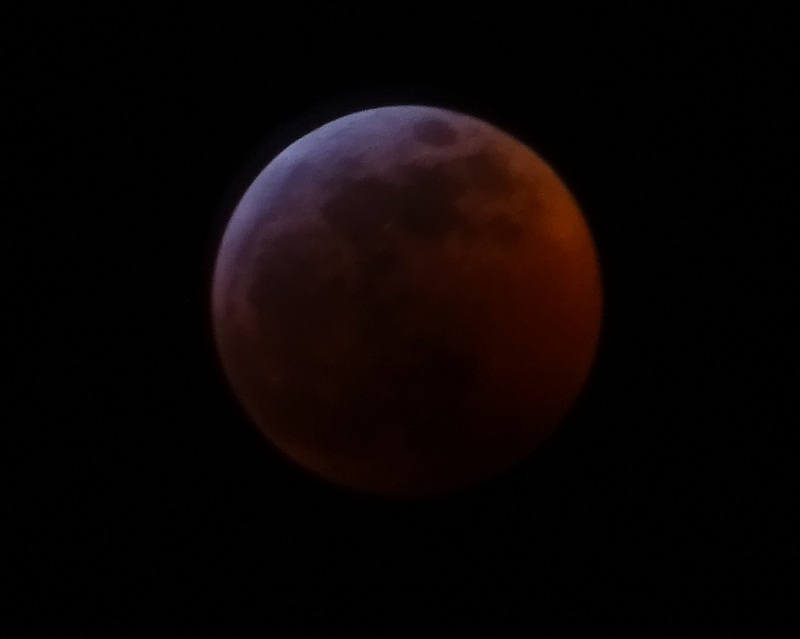 Managed to stay up for last night’s lunar eclipse (Okay, it was only until a little after 10:00pm, but I’m a wimp). we had a clear sky, and it was pretty impressive. After my first few attempts at getting a hand-held picture, I finally set up a tripod, and the pictures got a lot better–particularly since I just have a little cheapo camera. It was not as impressive as the solar eclipse from 2017, but for this one, we didn’t have to drive anywhere, just open the back door–although it was freezing cold last night. I kept having to run back inside to defrost. The press has been calling this the Blood Wolf Super Moon, which sounds cool–Blood because of the color–caused by light refracting through our atmosphere. Wolf because the January moon is called a wolf moon (or ice moon or snow moon or great spirit moon or Keith Moon). Super because it is the closest full-moon to perigee, so it appears a bit larger – the only time you get to use the word syzygy outside of a scrabble game! I guess that sounds better than calling it George.